HolaHolaHola My Beautifuls! Do you remember last month when Even BB Gets the Blues was posted? Bueno, a couple of days afterwards the plumber came and fixed the backed up kitchen sink. You know Babushka's first words? "Oh thank goodness, now I can really wash dishes!" Quee? After 6 months of doing the dishes with buckets- so I wouldn't have to siphon out the water from a clogged drain, I was truly grateful that a sink filled with dirty dishes could now be done in 15 minutes instead of 3 hours. Y no, not being Cuban here, I literally was using a baster to remove the backed up water. My reaction though logical and heartfelt was admittedly a surprise and I had to chuckle- looking forward to cleaning? BB? Next came the shut off of water. It would cost $450 to fix the DIY mishap Sweetie had trying to change the leaky shower washer. Needless to say we couldn't leave the leak running as it had now started going into the bedroom and soaked the carpet. Also needless to say is that we couldn't afford to fix it right then, so off came the water. After the initial shock we realized in the long run maybe this would lower our monthly utitility bill. The water pump (yes, Babushka's so rural I have a well) apparently was going non stop because of the leak and the electric bill was unreal. So maybe this was a blessing in disguise. Two weeks ago we were able to get the plumber back out here, so now we have water!! The kitchen has now sparkled for a time, but the rest of the house... You know us bloggers, addicts to the www.com. Everytime I would schedule to do something the click notifying me of Feibu or Tweety would lure me back to the screen. 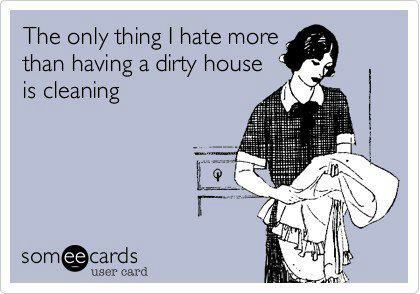 At the end of the day I would lament how I really hadn't done a thing towards housecleaning. Apparently the angels took pity on me and cut off my internet. I now use the library for internet access with a self imposed 2 hour limit and on Sunday nights go to Sweetie's to use his because the library is closed on Mondays. Of course if there are Tweety Fiestas I go to his house to participate and then go back home. And I don't intend on reconnecting my internet anytime in the near future, so there really are no excuses for a messy home. It's been almost two weeks since the distraction of Feibu and Tweety and Babushka's gathering strength and impulso to commence cleaning. Quee?? You thought BB's house would be clean by now? God's too busy laughing to perform That Milagro. Babushka Besos a todos. Cuidsen. love how you're looking at the silver lining. Keep it up girl, share your spirit. I completely agree with this ecard! Too funny! Ay BB! you are too funny! My housecleaning has suffered even more so since I began blogging. I admire your positive outlook despite it all! Es correcto, todo tiene una razon y veras que muy pronto la vas a ver. A veces nos ponemos en estas circunstancias porque no cuidamos lo que tenemos. Debemos de poner mas atencion a los regalos de Dios. I love cleaning my house! Dropping over from Grand Social. No hay prisa, jajaja. Cuéntame que estás haciendo con este "racionamiento" de internet? I have the same issue as Melanie. Too much time blogging, not enough time cleaning! I enjoyed your post! I am visiting from Grand Social Blog Hop. Your home sparkles because you're in it! I understand holding off until being able to afford the bill for repairing something. that reminds me, i have to call the TV repair guy! I am sure everything around you sparkles as much as your beautiful self! El feibu is too foni!!! You are so funny! God does have a wicked sense of humor? But still no such luck on the house cleaning huh? I'm so glad your water is back, I can't imagine being with out, and I can totally relate, without the internets ever beckoning "Notifications" I'd get a lot more around here done too! I can can certainly relate to this!! 2 years ago I didn't even know how to turn on a computer. Now I am addicted to Facebook and all my blogging communities. I am on the internet about 10-12 hours a day--and sometimes I forget to get dinner on the table. This does NOT make my family happy. But whenever the power goes out and I lose the internet, I go crazy. I think I need an intervention... hahaha! Hope you are doing well and haven't got lost in your pile of dishes! I know how you feel. My washer machine went out and you would have thought I was getting a pot of gold when I got a new one. It's the small things that make us happy!! So you where washing your dishes like in an "huracan caribeño" style! So funny! That is precious. Thanks for sharing this fun post. my computer crashed a few years ago, and it was a couple of months til I could afford a new one. I went to the library too. and I was going out of my mind. I do remember getting a lot done eventually around the house though. Love your sense of humor. Your posts always make me laugh. Hahahah! You are always in a good mood and I found this funny!